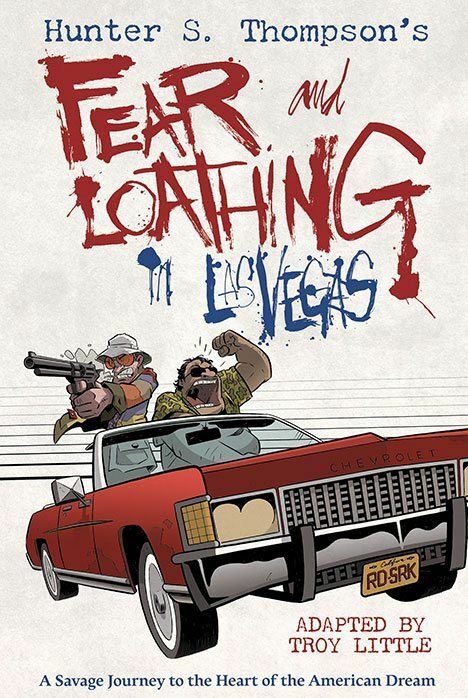 Hunter S. Thompson's Fear and Loathing in Las Vegas is a full-color graphic novel from Eisner-nominated comic book creator and writer-artist, Troy Little (Chiaroscuro). This hardcover original is a comic book adaptation of Fear and Loathing in Las Vegas: A Savage Journey to the Heart of the American Dream, the novel written by the late journalist, Hunter S. Thompson, and illustrated by Ralph Steadman. The original novel is influential; its adaptation by Troy Little is a masterwork. Fear and Loathing in Las Vegas first appeared in two issues of Rolling Stone magazine in 1971 (#95-96) as a two-part series. The series became the book, Fear and Loathing in Las Vegas: A Savage Journey to the Heart of the American Dream, in 1972. The story follows its protagonist, Raoul Duke (Hunter S. Thompson's alter ego), and Duke's attorney, Dr. Gonzo, as they travel to Las Vegas. This story is based on two actual trips to Las Vegas that Thompson took with his attorney, the Chicano activist, Oscar Zeta Acosta, who becomes Dr. Gonzo in the story. In Fear and Loathing in Las Vegas, Duke and Gonzo are initially in Las Vegas to cover “The Mint 400,” an off-road race for motorcycles and dune buggies that apparently offers the richest prize or purse for the winners. The second Las Vegas assignment is a request by Rolling Stone for Duke to write a 50 thousand word piece about a four-day seminar by the National Conference of District Attorneys. Along the way, Duke and Gonzo descend into a haze from their drug and alcohol-fueled bender. Duke searches for the American dream and ruminates on the failure of the 1960s counter-culture movement. After crashing a drug-enforcement conference, racking-up large room-service bills, and wrecking two hotel rooms, however, both men will discover that it is difficult to leave Las Vegas. THE LOWDOWN: As a former journalism student, I have heard of Hunter S. Thompson, of course. He was the gold-standard and a legend to fellow students, but to me, he was just another famous White journalist upon whose altar I was supposed to worship. I have never read Fear and Loathing in Las Vegas: A Savage Journey to the Heart of the American Dream, although I have had vague plans to do so for over two decades. I had seen him on television several times before he died, and I have read at least one piece written by him. Perhaps, I have read more, but I don't remember any of it. I know Thompson best by the most famous parody of him, “Duke,” the character in Doonesbury, Gary Trudeau's long-running satirical daily newspaper comic strip. I am familiar with the movie adaptations of Thompson's work, but have not seen those films. So, when Top Shelf Productions sent me a copy of their graphic novel adaptation, Hunter S. Thompson's Fear and Loathing in Las Vegas, I did not know what I was going to do. I considered ignoring it and not reading it, but Top Shelf has always been cool with recognizing me as someone they want to review their books. Of course, I should have had more faith in them. This book is an absolute blast to read. It is one of the best comic books of 2015, and I consider it a tremendous achievement on writer-artist Troy Little's part. Readers who admire comic books as more than just escapist entertainment, and thus, are always on the lookout for standout material, should read Hunter S. Thompson's Fear and Loathing in Las Vegas. The graphical storytelling, in particularly the art and illustrations of Fear and Loathing in Las Vegas the comic book, focuses on Duke and Gonzo's supernatural consumption of drugs, alcohol, and an amazing array of mind-altering substances. Little's cartoon recreation of Duke and Gonzo's mother-of-all-Vegas-benders is the most beautiful depiction of debauched substance abuse that I have seen since I first watched director Darren Aronofsky's Requiem for a Dream (2000). The vivid and spectacular colors bring the hallucinations and the claustrophobic cafes, conference rooms, and hotel rooms to life. Little's drawing style for this graphic novel is similar to the kind of drawing styles used by political cartoonists, which works quite well when the story engages the characters. The political styling connects Raoul Duke's political and social examinations to the main body of the narrative, which is about Duke and Dr. Gonzo's madness. I think that if the book has a fault, it is that the political and social ruminations are relegated to exposition in caption boxes. The art mainly focuses on the insanity of and the savage humor in Duke and Gonzo's interactions with drugs and with other people. Because I loved the glorious madness of Duke and Gonzo's demented Vegas adventures, I really don't want to find fault with anything, so if you want to believe that this graphic novel is not perfect, there you go... I was genuinely sad when I got to the last page of Hunter S. Thompson's Fear and Loathing in Las Vegas. I guess I'll have to start reading it again. POSSIBLE AUDIENCE: Readers looking for the best comics will want to inhale Hunter S. Thompson's Fear and Loathing in Las Vegas.